Lubuntu 13.10 is one of the best free Ubuntu Linux based operating systems for older computers, and laptops which were built in the 90s to 2014. Lubuntu is based on Ubuntu Linux, but uses the lightweight LXDE desktop Environment. This means all programs which work in Ubuntu will work on Lubuntu, and you will have more free RAM, and CPU cycles to run your programs. Having more free RAM, and CPU cycles is great for gaming, video editing, web browsing, and office tasks where your RAM, and CPU could become very full as more files are open. The LXDE desktop environment save a few dollars on your electricity bill, and extend the life of your battery because of its low CPU and Ram usages when in use. Lubuntu also starts up in under a minute, and shutdowns in only a few seconds. It also wakes from sleep in under a few seconds as well. The quickness of Lubuntu makes it a great OS for computers which need to turn on quickly like multimedia computers for watching video or listening to music where people want to start using their PC after pressing the ON button. I notice there are also fewer error messages when I use Lubuntu compared to other Linux based operating systems I used because my older computer can handle running Lubuntu very well. For most older computers with 1GB of RAM, a single or dual core CPU, and integrated video, Lubuntu should run pretty well on it.It also can be installed on smaller hard drive in the 5-10 GB size, so it can be installed on Nerbooks with small flash memory drives as well. I seen videos online where people run Lubuntu on tablets, and slower computers like the Raspberry Pi or Netbook laptops, so Lubuntu is a great operating system for older or slower devices with less RAM, and slower CPUs. It is also easy to install Lubuntu by starting Lubuntu from a CD with the Lubuntu CD image installed on it, and following the step by step instructions which will be displayed on the monitor for you to follow to install Lubuntu on your computer, or along side another Linux or Windows operating systems. You can also try out Lubuntu from the CD before installing it by clicking the install icon on the desktop after you finish trying out Lubuntu. Using Lubuntu as a desktop operating system is pretty simple. It’s user interface is like older versions of Windows like XP, 98, 95, and ME which has an Applications Launcher also called the Startmenu for launching programs like web browsers. It is also possible to make desktop and taskbar shortcuts to programs to quickly launch programs, and files. The windows, and programs in Lubuntu are resizable, so you can fit 2 or more programs on the same screen. The taskbar, windows, and other on-screen objects for Ubuntu uses very little monitor space. 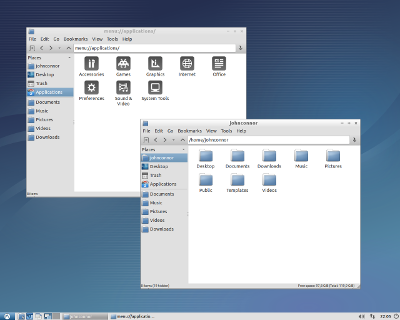 You can also set Lubuntu to hide the titlebars on Windows, and hide the taskbar to regain back more space. Lubuntu uses very little monitor space, so it is a great operating systems for netbooks, laptops, tablets, and other devices which has smaller screens. There are also no annoying pop-up notifications, and windows which can be distracting like other operating systems. Lubuntu also requires very little maintenance unlike other operating systems. I just need to run the software updater once in a while to make sure that Lubuntu, and all its software is up to date. Installing new software in Lubuntu is very easy with the Lubuntu Software Center which is a program for finding, downloading, and installing free Lubuntu compatible software like Libreoffice which will work for Lubuntu. Lubuntu also already comes with most of the software like Firefox Web Browser you need to use a computer. The software which I run in Lubuntu like Firefox is also very stable, and rarely crashes, or slow downs in my experience. Updating software in Lubuntu is also very easy because of the Lubuntu Software Updater which checks for new updates for all my software, and downloads, and installs updates when updates are released like how some Smartphones automatically downloads, and install new updates to apps when the updates are released. I have been using Lubuntu for a few months now, and it has been one of the fastest, and most reliable operating systems I ever installed on my older computer with a 1.8GHz CPU, 1GB of RAM, Nvidia GT 620 video card, and 320GB hard drive.